This is a completely customized soccer theme wedding cake topper ordered by one of our customers. 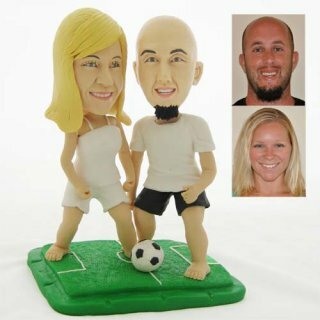 They want groom’s figurine to be wearing a white t-shirt and black soccer shorts, bride’s figurine wearing white tank top with white soccer shorts. Both figurines are bare feet and running pose going towards a soccer ball. For the base they want a soccer field base. For heads, the groom wants his figurine to be bald and have facial hair, goatee on his figurine, also make his calf muscles a little bigger than normal since he has really big calf muscles.